We had a bit of an unusual summer in SF with lots of heat and sun that was a departure from the typical fog and chill. The recent cool down has timed nicely with fall though. I for one have welcomed the cooler temperatures with open arms. I'm so ready for colder weather and a change in season. I've swapped my shorts and tanks for sweaters and jackets and couldn't be happier. Bring on the pumpkin spice, fall layers and everything else that's nice. On a recent shopping trip to Ross, I snagged this designer-label sweater. The cut-out shoulder and split side details are on par with current trends and I love the stark white color for the season. Surprisingly, my only pair of black denim came during my pregnancy days so I was doubly thrilled to come across a pair I liked at Ross. To give this look more texture and interest, I took a pair of scissors and did my own distressing. Yup, exposed skin during fall is definitely so California of us. *This post is in collaboration with Ross for the Ross Bargain Hunter program. Compensation was received but all opinions and ideas are my own. I love the ripped jeans and the boots! That cut outs on your sweater are really fun too! I LOVE this outfit!! So simple, and so cute! The cut out sweater is adorable! Those boots and your hair is on point! Cute look! 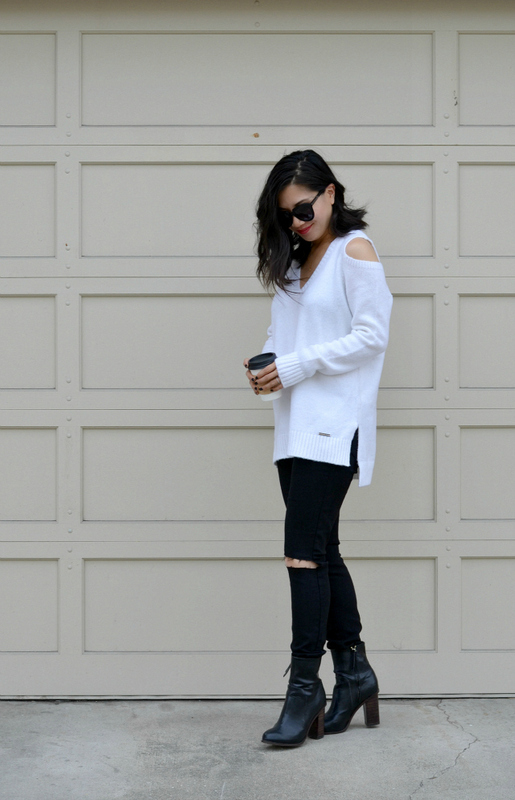 Great look Nancy - love the relaxed sweater with the fun details. That sweater looks so cozy! I'm torn between my want to wear layers and how much I'm going to miss the sun for the next 6 months. LOL. Maybe this winter will be sunny and cold? I can only hope! LOL. I love this outfit NANCY. It is modern and a little edgy. 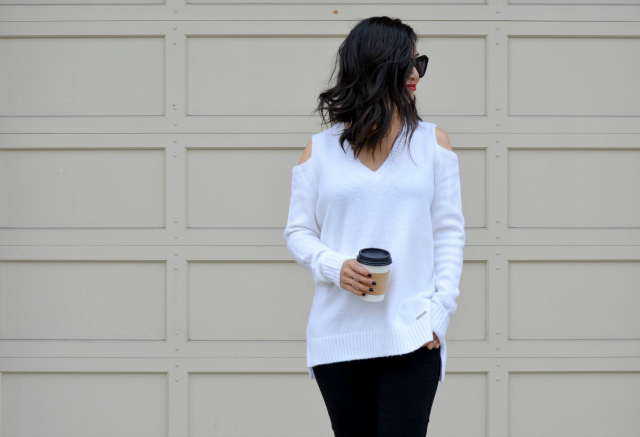 The cold-shoulder white sweater is gorgeous! I haven't seen a sweater with this shoulder detail. So cool! Great find. The cutouts on your sweater are so fun! and I love those distressed jeans! Great job on the distressing and that sweater looks fab on you! I love how comfy yet trendy this outfit is! Love your blog! LOVE the sweater!! I saw a burgundy t-shirt with shoulder cut-outs that I've been debating to get or not. Love that little detail! I love the laid back look. Too perfect! 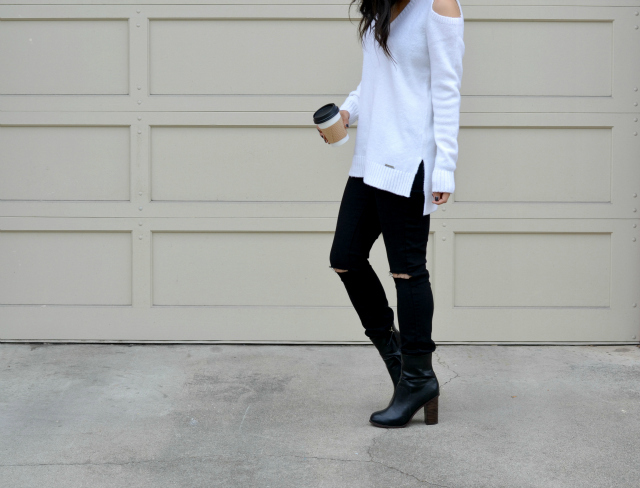 Very chic monochrome look and the cold-shoulder sweater is beautiful! 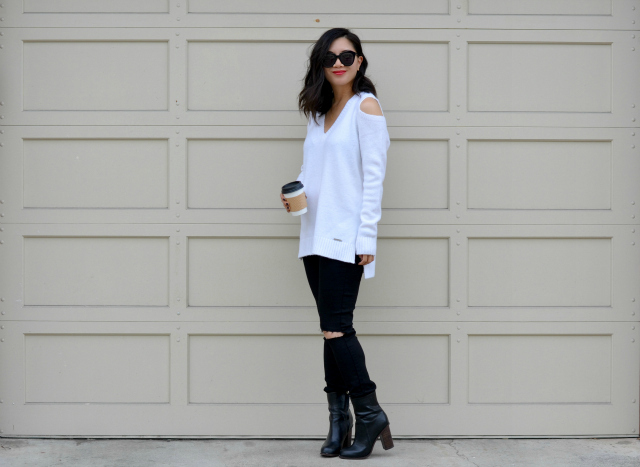 Love the cold shoulder sweater, and the jeans are perfection! as you said, excellent for this time of year--love the cut outs, too.so dang cute!! Such a cute sweater! I have a very similar one that I wore over the weekend! I love the cutout shoulders on this sweater. I have wanted to try this look for a while. After seeing you in this look I might have to try it out soon! You look fantastic! Ah, I totally love this look! Looks super cozy, but also ultra cool :) Killer boots too! This. This is what I'll be living in once it cools down...seriously. I love this casual, grunge look! You look fabulous with red lips!